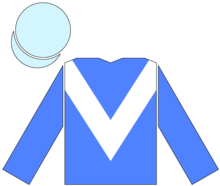 Maktoum bin Rashid Al Maktoum (ca. 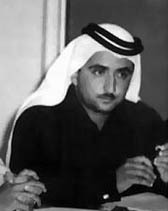 1943 – 4 January 2006) (Arabic: مكتوم بن راشد آل مكتوم‎; Maktūm bin Rāshid Āl Maktūm), also referred to as Sheikh Maktoum (honorific) was the Vice President and Prime Minister of the United Arab Emirates (UAE) and the emir (ruler) of Dubai. He was born in 1943 in Al Shindagha, Dubai to the Al Maktoum family of the Al Bu Falasah tribe. His father Sheikh Rashid bin Saeed Al Maktoum became the Ruler of Dubai upon the death of his own father, Sheikh Saeed bin Maktoum bin Hasher Al Maktoum (Saeed II), in 1958. Sheikh Maktoum was Prime Minister of the United Arab Emirates first from the country's independence on 9 December 1971 until 25 April 1979, when he was replaced by his father, who had been Vice President since 1971. Following his father's death on 7 October 1990, he resumed his position as Prime Minister of the United Arab Emirates, and also took over as Ruler of Dubai and Vice President of the United Arab Emirates. He served in all three positions until his death on 4 January 2006. Sheikh Maktoum also briefly served as acting President of the United Arab Emirates on 2–3 November 2004 between the death of Sheikh Zayed bin Sultan Al Nahyan and the proclamation and installation of his son Sheikh Khalifa bin Zayed Al Nahyan as President of the United Arab Emirates on 4 November 2004. Sheikh Maktoum ran the emirate of Dubai along with his two brothers, Sheikh Mohammed (Crown Prince and Minister of Defense) and Sheikh Hamdan (Minister of Finance) of the United Arab Emirates. Internationally, he was also known as co-owner (with his brothers) of Dubai's Godolphin Stables, which competes in major horse races around the world. Sheikh Maktoum bin Rashid al Maktoum died on the morning of 4 January 2006, suffering a heart attack while staying at Palazzo Versace Hotel in Gold Coast, Queensland, Australia. He was succeeded by his brother, Sheikh Mohammed bin Rashid Al Maktoum as ruler of Dubai. His body was brought back from Australia and buried in Dubai. ^ ARR: Arab Report and Record. Economic Features, Limited. 1971. p. 136. Shaikh Maktoum bin Rashid al-Maktoum, the Ruler's heir, married a cousin, Alia bint Khalifa, on 12 March. ^ "Sheik rattled but not 'rolled' as bodyguards take children sheik" (1 May 2000). The Birmingham Post (England). Retrieved 17 April 2018. The drama began when the Yard received a 999 call from a nanny employed by the sheik's second wife, Sheika Bouchra Bint Mohammed Al Maktoum. ^ "Strange case of the sheikh's daughter". 10 December 2001. Archived from the original on 24 March 2018. Retrieved 14 April 2018. ^ "DUBAIS FIRST LADY SELLS JEWEL-STUDDED PAINTING FOR CHARITY". 8 March 2000. Archived from the original on 14 April 2018. Retrieved 14 April 2018. ^ Desmond O’Neill. "HH SHEIKHA BOUCHRA BINT MOHAMMED AL MAKTOUM at a party in London on 16th March 2000.OCC 59". Archived from the original on 14 April 2018. Retrieved 14 April 2018. ^ Desmond O’Neill. "Left to right, SIR MOULAY OMAR EL MOURADI uncle of Her Highness Sheikha Bouchra Bint Mohammed Al Maktoum and HH ARTIF AL BOUAZZAOUI brother of Her Highness Sheikha Bouchra Bint Mohammed Al Maktoum, at a party in London on 16th March 2000". Archived from the original on 14 April 2018. Retrieved 14 April 2018. ^ "Sheikh Maktoum Bin Rashid Al Maktoum dies". gulfnews.com. Archived from the original on 25 September 2015. Retrieved 21 May 2015. ^ "Dubai's ruler Maktoum is buried". 14 November 2017. Archived from the original on 14 November 2017 – via news.bbc.co.uk. ^ Since 1979, the Prime Minister of the United Arab Emirates has also held the office of Vice President of the United Arab Emirates. This page was last edited on 17 April 2019, at 01:15 (UTC).